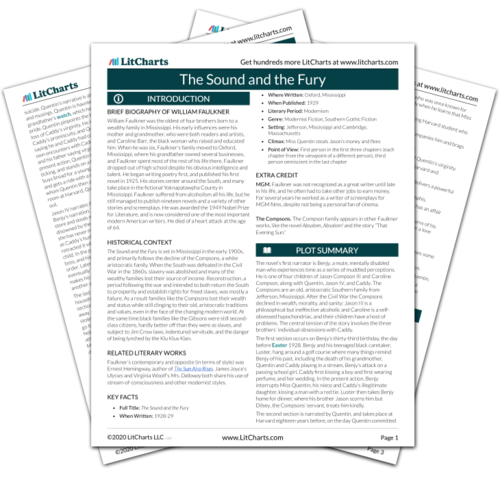 Instant downloads of all 942 LitChart PDFs (including The Sound and the Fury). Quentin’s father gave him his watch in the hopes that it would make him occasionally forget about time, but the watch only increases Quentin’s obsession. Because it belonged to his father and grandfather, the watch reminds Quentin of his family’s honor and heritage, which then contributes to his guilt and depression regarding Caddy’s sins and his own perception of how the family has fallen. Quentin tries to break the watch to free himself from its constant haunting presence, but the watch keeps ticking even without its hands. When he goes to drown himself, Quentin leaves the watch behind in his room, but it is the sense of time – and his own unimportance within history – that actually drives him to suicide. This watch also symbolizes the larger theme of time itself, and how different characters perceive it in the novel. For Benjy the past and present meld together into one vague series of perceptions, but for Quentin everything is precisely marked off by the defined ticking of his watch. ). Note: all page numbers and citation info for the quotes below refer to the Vintage edition of The Sound and the Fury published in 1990. When the shadow of the sash appeared on the curtains it was between seven and eight oclock and then I was in time again, hearing the watch. It was Grandfather’s and when Father gave it to me he said I give you the mausoleum of all hope and desire… I give it to you not that may remember time, but that you might forget it now and then for a moment and not spend all your breath trying to conquer it. 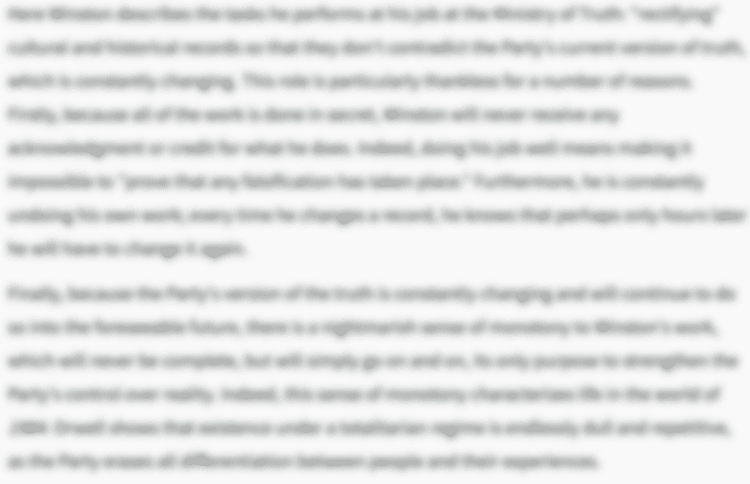 Unlock explanations and citation info for this and every other The Sound and the Fury quote. I went to the dresser and took up my watch, with the face still down. I tapped the crystal on the corner of the dresser and caught the fragments of glass in my hand and put them into the ashtray and twisted the hands off and put them in the tray. The watch ticked on. 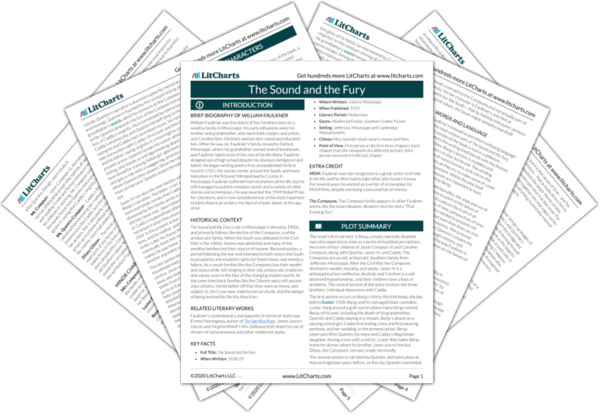 Get the entire The Sound and the Fury LitChart as a printable PDF. The timeline below shows where the symbol Quentin’s Watch appears in The Sound and the Fury. The colored dots and icons indicate which themes are associated with that appearance. Cosby, Matt. "The Sound and the Fury Symbols: Quentin’s Watch." LitCharts. LitCharts LLC, 19 Mar 2014. Web. 22 Apr 2019. Cosby, Matt. "The Sound and the Fury Symbols: Quentin’s Watch." LitCharts LLC, March 19, 2014. 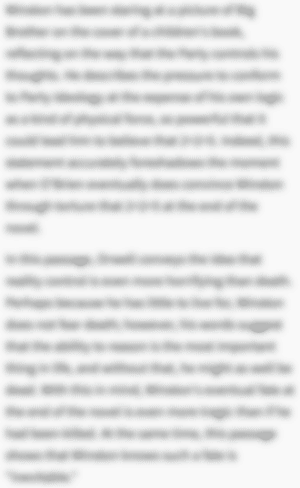 Retrieved April 22, 2019. https://www.litcharts.com/lit/the-sound-and-the-fury/symbols/quentin-s-watch.